On the weekend my camera began giving me trouble and tonight I found out that it will take 3-8 weeks to repair. I told the clerk at the store that not having my camera was like losing a part of me…which is dramatic I know. Yet I had great plans for my photography in this my summer of no commitments. One of the challenges will be keeping my blog going. I will ponder this wrinkle and decide the way forward. 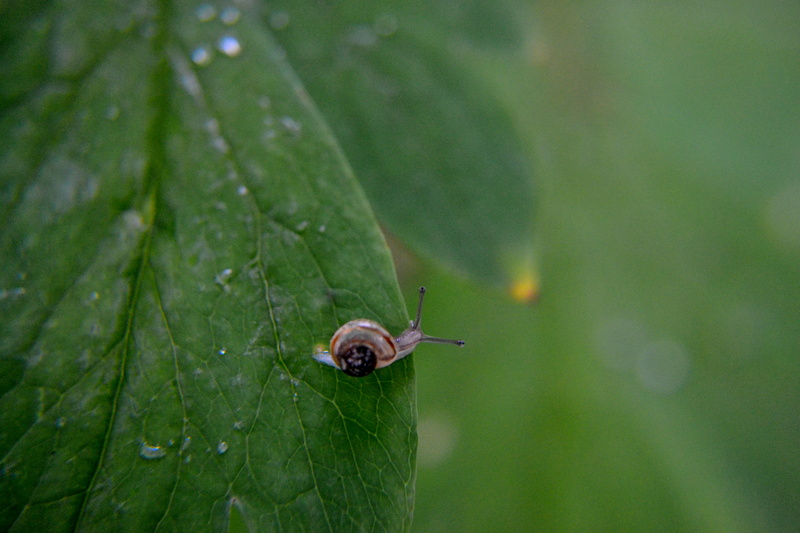 An excellent pic of a snail and that lovely leaf. Liked. *Not knowing the type of gear you use, how about getting a point and shoot and/or use your cellphone; you’ll be amazed with the results! Cheers! I agree that both my point and shoot and my phone have surprising results. I need to work on composition and subjects beyond the macro world so both of those fit the equipment requirements for that! You seem to be coping very well without your camera. I would hate to be in your position. I have a large store of photos to use in the interim. Thankfully!